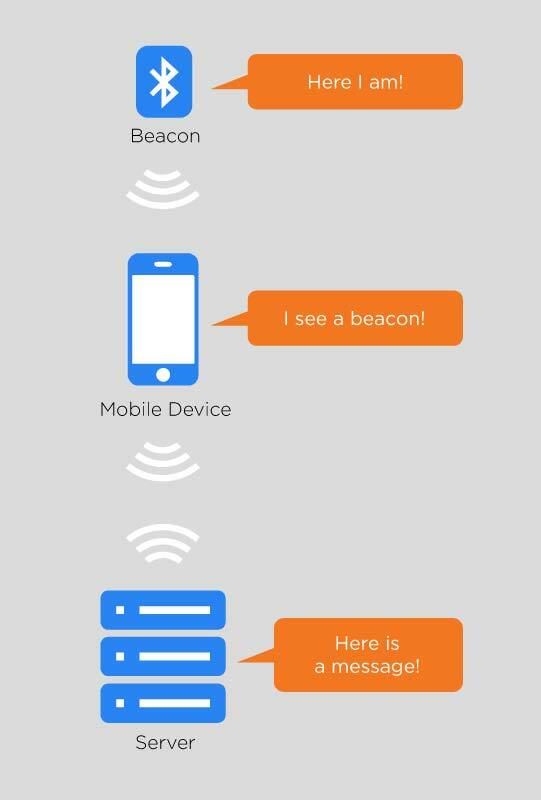 What Is a Beacon, Anyway? Beacons play an important role in mobile location detection. When you think of a beacon, what comes to mind? A fire on a remote mountain? A blinking light at the top of a building? A lighthouse? Just like these traditional beacons, wireless beacons are designed to communicate an important message to everyone within a certain proximity. Beacons are small Bluetooth-enabled devices that transmit a continuous signal. The signal is “heard” by devices within a certain distance (from a few inches up to about a hundred feet) from the beacon. If a device has the relevant app installed when it recognizes the beacon, it will begin to communicate with the server to “ask” if it has any relevant information to share. Many companies today are using this location awareness as an opportunity to send contextually relevant push notifications to users’ devices—things like special offers, reminder and welcome messages, and other alerts. In other words, beacons help people connect in context. What Role Do Beacons Play in the Network? Beacons are invaluable tools for mobile interaction, but they are only one element in the location technology universe. It’s important to understand the role of the different location technologies, and where beacons fit in. GPS is accurate, but because it depends on satellite communication, it doesn’t work well inside a building or anywhere without a clear line of sight to the sky. Additionally, because GPS location detection is persistent, it can increase the load on network traffic and drain the battery of a mobile device. Wi-Fi networks can be very precise at location detection, especially with multiple routers and add-on software to triangulate their signals—essentially turning the Wi-Fi network into a mini-GPS. Unfortunately, Wi-Fi users are required to consent to network connection, which adds an additional step to the interaction and may reduce the frequency of engagement. Beacons provide the greatest accuracy; and with the introduction of Bluetooth Low Energy technology (BLE), beacons can be deployed almost anywhere. Whereas once the battery consumption of Bluetooth technology limited its applications, the advent of BLE has opened up a new world of location-enabled possibilities. Each BLE beacon has a very small footprint and is designed to operate for years on standard coin cell batteries. BLE also supports enhanced range capability of up to 200 feet. Beacons are not only easy to deploy—the fact that they only interact with in-range mobile devices limits costly network traffic and reduces the drain on mobile battery life. Retail locations use beacons to provide their most loyal customers (those with the store’s app on their smartphones) with customized offers while they are in the store. Beacons placed in a certain department or on a certain display can be detected by in-range mobile devices, and thereby trigger a message containing a coupon, special offer or additional product information. Schools can use beacons to keep track of district-owned mobile devices. If a student moves a device beyond a specific threshold, like a classroom door, an alert can be triggered. Similarly, hospitals can use beacons for asset tracking, thereby reducing time spent hunting down pieces of equipment (not to mention theft and loss). Anyone in a large building or campus environment—hospitals, universities, municipalities and businesses—can use beacons to help people find points of interest or to trigger “you are here” notifications in a wayfinding application. Businesses are using beacons today to deliver engaging, interactive experiences. World Wrestling Entertainment (WWE) is recognized for its intense fan interaction, so expectations for its mobile application were high. During WrestleMania 30, the organization’s flagship event, WWE implemented a highly interactive application using iBeacons. Beacon technology helped WWE deliver 44 campaigns resulting in 30 percent engagement, blowing traditional marketing campaign engagement out of the water. Retail giant Macy’s recently announced plans to implement beacons in all of its stores after successful flagship test run. The retail implementation will be the largest to date, involving more than 4,000 beacons and creating new expectations for the in-store experience. The benefits of beacon technology aren’t reserved for large organizations, however. Several companies have offerings that help small businesses and even individuals use beacon technology in daily life, and they’re barely scratching the surface of possible beacon use cases.